Under the BeeZero brand name, the Group’s newly founded subsidiary, Linde Hydrogen Concepts, launched in Munich the world’s first car sharing service to exclusively use hydrogen-powered fuel-cell cars. The new car sharing service will be run on a zone-based model. 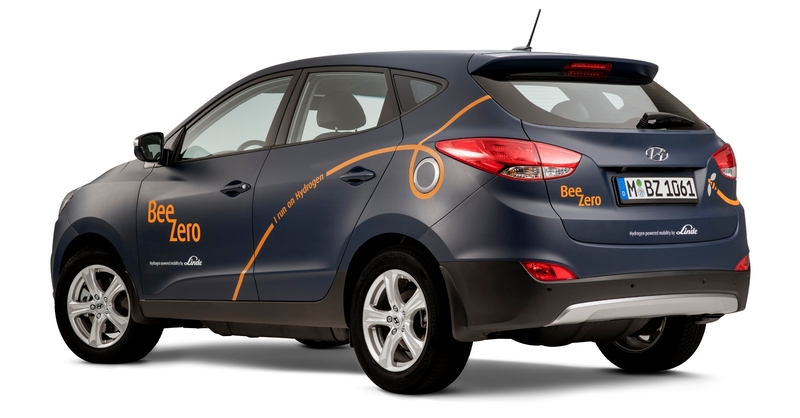 The BeeZero fleet will comprise fifty ‘Hyundai ix35 Fuel Cell’ cars, which will be available in the city centre and also in the areas of Schwabing, Haidhausen, Au and Glockenbachviertel. It is the world’s first major fleet of fuel-cell cars run by a single operator. As with conventional car sharing services, the cars can be easily booked online or via a smartphone app. Fuel-cell vehicles can travel over 400 kilometres on a single tank. This means that – unlike battery-powered electric cars – the hydrogen vehicles are also ideal for medium-distance journeys, for example, to the Bavarian lakes or the mountains, and not just for short trips in the city. The cars will be refuelled by BeeZero employees. The hydrogen fuel is sourced exclusively from sustainable production processes, making it completely carbon neutral.